St Pat’s won their first league game in two months last Friday night against Derry City. Liam Buckley: "We're working hard to stay up and that's what we've got to do." 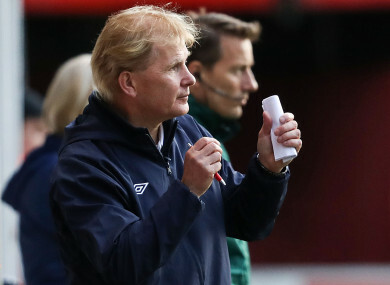 LIAM BUCKLEY DID not allow the joy of a first league win in two months distract St Pat’s from the anxious situation his side find themselves in this year. The Inchicore club are aiming to avoid a first relegation in the club’s 88-year history having spent a large portion of this season in the bottom three. A 2-1 win against European hopefuls Derry City last Friday night moves the Saints up to 10th place, but manager Buckley was pragmatic in his assessment of what could prove to be a landmark victory. “It was an important win for us”, he said. “There have been a lot of games in recent weeks where we haven’t been that bad, but we’ve picked up nothing from them. Tonight the lads worked hard for the 90 minutes and I think we probably deserved the win. “It is a relief to get three points because it gets us out of the bottom three. We are still in the mix here – there are six or seven teams at the bottom end of the table that could easily get dragged into it. “When you’re winning games it’s very difficult to see yourself losing and when you’re losing games it’s hard to see yourself winning. “It’s a bit of a confidence thing as well. We were down in Galway and 1-0 up heading into the 90th minute and we gave a penalty away. We were playing Limerick here (trailing 1-0), get a penalty and miss it. It’s stuff like that which has flipped us to where we are at. Buckley was reflective on the win afterwards. His side have lost six home games from nine in 2017 and looked to be adding another defeat to the list when they entered the changing rooms 1-0 down to Kenny Shiels’ side at the break. But a second half revival courtesy of goals from Kurtis Byrne and Graham Kelly saw them take all three points in just their third home win of the season. It was the club’s first win in the Premier Division in nine games, moreover in two months, stretching back to May. With players of significant quality it has been surprising that the 2013 Premier Division champions have been dragged into a relegation dogfight. However, as in defeat, in the aftermath of victory Buckley remained optimistic and took time to praise his side’s supporters who he admits have had to endure a difficult season at Richmond Park. “It’s a funny old game, sport. You can’t buy confidence. You can keep working and keep getting your chances and when there are too many players in the team not to score, eventually it will happen. “Our supporters have been fantastic all season. I think they know the situation we are in and I think they appreciate how hard we are working and what we are trying to do. “We’ve juggled (the squad) around a little bit, brought in one or two players to try and bolster our position in order to move up the table. Buckley said he would consider bringing in more players to add to his three signings during the summer transfer window in Killian Brennan, Owen Garvan and Dutch defender Jordi Balk. The St Pat’s boss said he was keeping tabs on the situation at Bray Wanderers, whose players placed themselves on the transfer list with immediate effect last Friday morning. “I’m taking a look around to see where we can strengthen”, he said. “There’s not a lot that you can bring in during this window unless someone is a substitute at another team. “I’ve worked with many of those players out in Bray – Anto Flood was a league winner here with us. “Some would interest me if they were out. But we don’t know if they are in or out, whether they’re for sale or not for sale, whether they’re paid or unpaid. Something is definitely coming on that, but we’ll have to see. St Pat’s welcome Bray to Richmond Park on Friday night knowing another three points could prove crucial to their hopes of playing in the Premier Division again next season. Harry Kenny’s side, meanwhile, went down 2-0 to Cork City with Preston-bound Sean Maguire scoring in his final League of Ireland game for the league leaders – his 20th goal of the season. Email “Liam Buckley: 'Somebody joked in the dressing room that we're only 13 points off Europe'”. Feedback on “Liam Buckley: 'Somebody joked in the dressing room that we're only 13 points off Europe'”.